Omaha, Neb., March 29, 2012 – Missouri Governor Jay Nixon, representatives of the Missouri Department of Transportation, Federal Railroad Administration, Union Pacific Railroad and Amtrak today officially broke ground for a new $20 million, 1,200-foot railroad bridge across the Osage River that will add capacity and is designed to reduce delays on the route used by Amtrak Missouri River Runner trains between Kansas City and St. Louis. 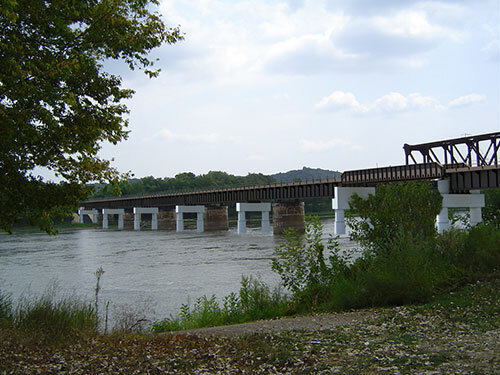 The new bridge, located just east of Jefferson City in Osage City, Mo., will unclog a major "bottleneck" that was caused when two tracks would funnel to one to cross the Osage River on a single-track railroad bridge and then connect back to a double mainline track. When the bridge is complete, the rail corridor between St. Louis and Jefferson City will consist entirely of two mainline tracks. The project is Missouri's first rail infrastructure project to be awarded and begin construction under the American Recovery and Reinvestment Act. "This bridge will help spark new jobs and economic growth in Missouri, both during its construction and as it helps move passengers and freight across Missouri more efficiently, more safely, and in greater numbers for many years to come," Gov. Nixon said. "The project eliminates the last bottleneck on the eastern portion of our St. Louis to Kansas City corridor which will benefit those riding the Missouri River Runner trains and Union Pacific customers," said Bob Turner, senior vice president – corporate relations Union Pacific Corporation. "MoDOT is a great partner and all of us at Union Pacific look forward to working with them on more public/private partnerships like this one, which benefits everyone across Missouri." "The improvements being made to this corridor will provide the people of Missouri with faster, more convenient connections to cities throughout the Midwest and help promote economic development throughout the region," said Federal Railroad Deputy Administrator Karen Hedlund. "We are thrilled to get the Osage River bridge under construction by a local Missouri firm," said MoDOT's Multimodal Operations Division Director Michelle Teel. "This project will help maintain the much improved performance of the state-supported Missouri River Runner and benefit freight movement across the state. Without support from the federal government and our railroad partners, we couldn't make the investments necessary for such improvements." "Ridership was up by nearly 15-percent just last month on the Missouri River Runner trains – and I think high gas prices are not the only reason. Another reason has to be the work the State of Missouri, Union Pacific and Amtrak have done to improve this service," said Tom Carper, Chairman of the Amtrak Board of Directors. MoDOT commissioned a study by the University of Missouri to determine where rail line capacity enhancements should be made to improve train velocity. The Mizzou study helped MoDOT and Union Pacific's engineering and network planning groups make solid choices where capacity projects should be considered across the 275-mile rail corridor. The new bridge will enable all trains that use the corridor to operate more efficiently. MoDOT received a multimillion dollar award under the Recovery Act, which will fund a majority of this project. Union Pacific is providing the remainder of the project cost. The bridge is being constructed by OCCI, Inc., from Fulton, Mo. According to MoDOT, nearly 90 percent of the Missouri River Runner trains arrived at their end-points of St. Louis or Kansas City on-time or ahead of schedule in fiscal year 2011. These same passenger trains were operating an average of 64 percent on-time in 2008. These service improvements are directly linked to the capital investment – capacity and maintenance – Union Pacific has invested on the corridor, as well as a $5 million appropriation by the Missouri General Assembly for construction of a rail siding near California, Mo. completed in 2009. Our mission is to provide a world-class transportation experience that delights our customers and promotes a prosperous Missouri. For more information, visit www.modot.org or call 888-ASK-MODOT (888-275-6636) within Missouri. Celebrating 40 years of dedicated service as America's Railroad® Amtrak is the nation's intercity passenger rail provider and its only high-speed rail operator. A record 30.2 million passengers traveled on Amtrak in FY 2011 on more than 300 daily trains – at speeds up to 150 mph (241 kph) – that connect 46 states, the District of Columbia and three Canadian Provinces. Amtrak operates trains in partnership with 15 states and four commuter rail agencies. Enjoy the journeySM at Amtrak.com or call 800-USA-RAIL for schedules, fares and more information. Join us on facebook.com/Amtrak and follow us at twitter.com/Amtrak.